No GCE Ordinary Level certificate for a good portion of our high-flying Members of Parliament. This is no ordinary issue, neither is it a laughing one. It’s serious, very serious. 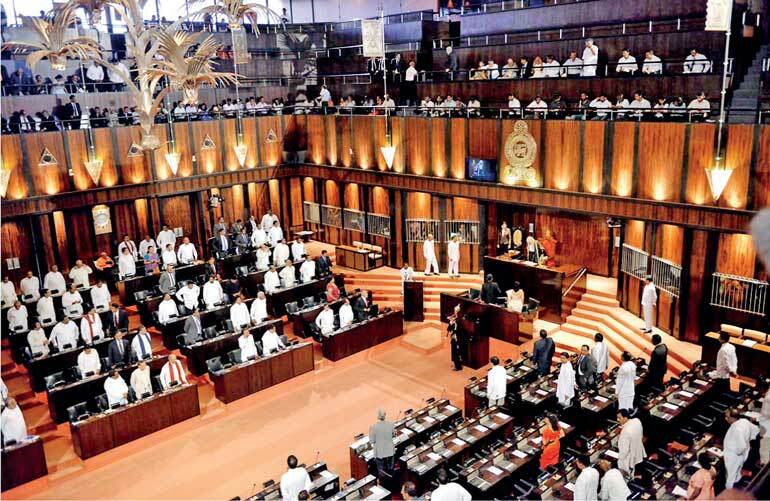 Parliament is the supreme legislative body of Sri Lanka and if elected members lack a basic qualification then it’s a poor reflection on our democracy. It has now transpired that 142 out of the 225 members in the current Parliament have not passed the GCE Advanced Level examination while 94 of the 142 MPs have not even passed the GCE Ordinary Level examination. This is a startling revelation, a perplexing paradox. How did they get there? That is the billion-dollar question. Another one of those farcical happenings in Paradise Island. Unqualified legislators perhaps by virtue of a gifted gab and political connections got elected to high office. In no time, they begin to wield superlative power and romp the high life, grossly insulting those that put them there in the first place. The bizarre yet notorious culture of indifference over capability, eligibility and suitability, further compounded by a lack of regulatory policy, has led to this derisory contemporary situation. Family bandyism is a long-cherished tradition in Sri Lanka. If a father dies while in office, his wife, son or daughter are considered the natural inheritors of his position regardless of what they may have in terms of actual substance. It seems constituents have a lot of tolerance for this kind of ‘trespassing’. Unique and photoshopped smiling faces bedecking private walls during elections say it all. Qualifications and general IQ are forgotten and disregarded by the voter. A good ‘Sangeetha Sandarshanaya’ is all what is needed with ample dancing space to send the masses into a frenzy. What a great understatement for those who say democracy is not the most perfect system. It seems that these present Members of Parliament had expended, deliberated and strove to date without the basic qualification required. The GCE Ordinary Level is a bare minimum for a legislator in Sri Lanka. I wonder what people like Dr. Colvin R. De Silva or Dr. N.M. Perera would have said about this lugubrious state of affairs had they been amongst the living. Actors, actresses, cricketers and anyone of appeal are placed as candidates sans tangible merit. The objective is apparent - to win votes. Is this something good for the country? Is this the best approach? Of course Gamini Fonseka and Vijaya Kumaratunga were in a different league. Even Ranjan Ramanayake is a great contributor. Exceptions are always there. For sure I would have preferred World Cup-winning cricket captain ‘Captain Cool’ Arjuna Ranatunga to have been the President of Sri Lanka Cricket and Master Blaster Sanath Jayasuriya its CEO. The duo could have done wonders. In principle those most suited to engage in politics are those sincerely and positively disposed to work for the people and towards their socioeconomic development. This requires basic qualifications, intelligence and lots of skill, pragmatism, real commitment and common sense. Isn’t it necessary for voters to know the qualifications of their would-be representatives before a general election? Shouldn’t it be made mandatory for candidates to reveal their qualifications? The preservation of a healthy democratic process necessarily hinges on the insight, intelligence and competence of their elected representatives. In this context mandating a basic qualification regime has become necessary today if not inevitable. This is a palpable affront on constituents whose diverse and unique issues the right honorable Members of Parliament are supposed to represent with understanding, intelligence and insight. No wonder our Parliament today is reduced to a mere talking shop and that too with wholesome unparliamentary stuff coalescing big time. This is not to say that the PhD’s speak sense all the time. Sri Lanka without a doubt is at a turning point in its tumultuous and checkered history. Decades of murder, mayhem and macabre incidents have come to an end, economic steam is picking up and is poised to take off big time. Amidst all these sparks comes this disgraceful revelation. This is not good. Sri Lanka must have the right people to efficiently navigate the course. Sri Lanka can learn many things from Canada. Its young, dynamic and energetic Prime Minister Justin Trudeau certainly wants his Government to reach for the stars. He probably called on the right man for at least one Cabinet job, appointing the first Canadian in space as his Transport Minister. Mark Garneau logged over 675 hours in space on space shuttle missions in 1984, 1996 and 2000. The Canadian Defence Minister Harjit Sajjan is a decorated lieutenant-colonel in the Canadian armed forces, the first Sikh Canadian to command an army regiment, having served in Bosnia and Afghanistan. Muslim Canadians also praised Maryam Monsef’s appointment to the Democratic Institutions portfolio. She becomes the first Muslim Canadian in Cabinet. Upon arrival as a refugee, Monsef relied on the support of several charity organisations, including the YMCA and the Salvation Army. In 2003, Monsef enrolled at Trent University, from which she graduated in 2010 with a Bachelor of Science in Biology and Psychology. Recently, the firebrand leader of the JVP Anura Kumara Dissanayake was addressing a meeting where he said that Prime Minister Ranil Wickremesinghe was working with a kind of a ‘Kitchen Cabinet’ and that too with just a single Member of Parliament. The names mentioned by him included Charitha Ratwatte, Malik Samarawickrama and R. Paskaralingam. No doubt that if what the JVP MP said was true, the motley assembly comprising the so-called ‘Kitchen Cabinet’ is unconstitutional and undemocratic. On the brighter side of things what can the Prime Minister expect or ask to perform from those without a GCE Ordinary Level certificate?